Late on Friday (March 30, 2012), Microsoft and Motorola Mobility each brought a motion for partial summary judgment on certain issues relevant to their dispute in the Western District of Washington that is centered around Motorola's FRAND licensing obligations. Two days before, Microsoft had filed a motion for a temporary restraining order and preliminary injunction against the enforcement of a German patent injunction that the Mannheim Regional Court might hand down on April 17. Microsoft's summary judgment motion asks Judge James L. Robart to find Motorola in breach of contractual commitments. Motorola's motion requests a finding that Microsoft "has repudiated any benefits it may have had as a beneficiary of Motorola’s promises", which would involve a determination that Motorola did not breach any contractual obligation or promise and a denial of the existence of any such FRAND obligation going forward. This relates to the H.264 video codec standard. On the left side of that chart, Microsoft highlights that it pays to the MPEG LA pool (which contains 2,339 patents on H.264, contributed by 29 different companies) an annual royalty that is capped at $6.5 million. If the cap didn't exist, the amount would be $60 million. By sharp contrast, Motorola holds only 50 such patents but has made a royalty demand that would, even in the most conservative (!) estimate, amount to $4 billion. It's conservative because, as Microsoft's motion explains, Motorola wants 2.25% of the price of the relevant end product (i.e., an entire computer running Windows), and the underlying assumption here is a very low average per-PC price of $500. Even on that basis, it would take little more than three years to arrive at an aggregate royalty amount -- just for H.264 and with respect to Windows -- in excess of the $12.5 billion Google offered for Motorola, or actually less than three years if one counts both standards (also including 802.11) and all of the products with respect to which Motorola is asserting allegedly essential patents. The motion also says that "Motorola sought royalties from Microsoft that were several times greater than the total royalty revenue that Motorola receives from all of its other licensees combined". It's not hard to see that something is fundamentally wrong with Motorola's demand. I have heard and seen Motorola argue -- in open court as well as in written pleadings -- that the whole purpose of the MPEG LA was allegedly just to bring down licensing costs for some large players and to maximize adoption. Furthermore, Motorola claims that its patents are exceptionally valuable. Even if one assumed, just for the sake of the argument, that Motorola had a point here, the discrepancy between Motorola's demand and the pool rates is so huge that it cannot be explained away on that basis. On the left side, you see a cartoony image of the Xbox 360. The $199 price tag is again very conservative: it's the price of the least expensive Xbox. The little yellowish circle indicates the Marvell chip implementing the 802.11 standard, magnified to the right of the Xbox and shown with a $3-$4 price tag. That chip comes with a lot of patent rights. On the right side, you then see that Motorola's royalty demand, even if based on the cheapest Xbox, would exceed the price of the component it actually relates to. The motion notes that "when judged in terms of a potentially legally-plausible royalty base, Motorola wanted a royalty of more than 100%". This highlights the "royalty base" problem (the base against which a royalty percentage is applied) I discussed in bullet point no. 2 of this recent post on an Apple letter to a standard-setting organization. The motion goes on to say that "[a]pplied to sales of higher-end Xboxes (those with additional components like larger hard drives or the Kinect sensor), Motorola's offer even more plainly would capture value entirely unrelated to Motorola's marginal contribution to the 802.11 standard, because the royalty demand on such units is more than twice the price of the entire 802.11 chip--i.e., Motorola was demanding an effective royalty rate of more than 200%". The royalty base issue is, unsurprisingly, also relevant to Motorola's demands with respect to H.264: "Likewise, even for a low-end $500 computer, Motorola demanded a royalty of $11.25, which is a substantial portion of the average price of Windows--of which support for H.264 video decoding is only a tiny part." Microsoft's motion points out that dozens of other companies hold patents that have been declared essential to the standards in question, and "[i]f each of the others demanded similar royalties, the total royalty would exceed 50% of the end-product price and 3000% of the relevant component value". In light of all of this, Microsoft's motion refers to Motorola's position -- literally dozens of times -- as "blatantly unreasonable". The repetitive use of that word is due to the fact that, as a recent court order revealed, "counsel for Motorola agreed [at a hearing] that blatantly unreasonable offers would violate its RAND obligations under the policies". That way, Motorola's own lawyer conceded the breach-of-contract theory at the heart of Microsoft's partial summary judgment motion. The legal threshold for a summary judgment motion is that its legal theories must succeed even if all of the disputed facts are viewed in the light most favorable to the other party. The court will hold a FRAND mini-trial to have a jury evaluate the disputed facts, but it allowed certain summary judgment motions (as well as Microsoft's aforementioned preliminary injunction motion) in order to adjudicate whatever can be decided without a jury. Motorola will certainly try to create factual disputes, in addition to raising legal issus such as over applicable law and its interpretation. But there appears to be so much of a discrepancy between Motorola's royalty demands and anything that could be viewed as a remotely reasonable rate that a breach-of-contract finding is fairly possible even prior to the involvement of a jury. For example, Microsoft's extrapolation that the total royalty for the relevant standarsd would exceed "50% of the end-product price and 3000% of the relevant component value" is by a huge factor above anything that can be considered a reasonable total licensing cost for standard-essential patents. For example, if one assumed five times the cost of the "relevant component value" stated by Microsoft, the total royalty percentage would go down from 3000% (for all patent holders) to 600% -- and it would still be nowhere near a FRAND rate. "Motorola will leave this offer open for 20 days. Please confirm whether Microsoft accepts the offer." At the time, the companies were already embroiled in litigation since Microsoft had sued Motorola on October 1, 2010, for patent infringement. In that situation, Microsoft apparently assumed that Motorola was going to sue after the end of the 20 days, or even sooner if Microsoft had rejected those terms: "Motorola apparently believed it could paper over its RAND obligations by delivering a blatantly unreasonable, sham offer to Microsoft, waiting for the 20 days Motorola prescribed, and suing on its standard-essential patents." In a recent order, Judge Robart already made clear that there's nothing wrong with taking a dispute over FRAND licensing terms to court. "Rather than seeking genuinely to fulfill its contractual duties, Motorola's obvious strategy was just the opposite--to make an offer that Microsoft was sure to refuse so that Motorola then would be free (in its view) to sue on its standard-essential patents to gain leverage in other disputes with Microsoft." The motion claims that this was confirmed by the testimony of two Motorola IP executives, a smoking gun kind of claim that I can't verify because any quotes from those depositions have been redacted in the public version of the motion. But even without access to that information, it's quite obvious that Motorola didn't expect its 2.25% demand (to be applied against an unreasonable royalty base) to be met within that 20-day period. Microsoft describes Motorola's strategy as one of "leveraging the 'bullets' of its standard-essential patents to wrest either crippling royalties, or licenses to Microsoft patents (including non-standard-essential patents), from Microsoft". Motorola, of course, claims that its royalty demand was a reasonable basis for starting negotiations, and denies that it ever made a demand for a license to non-standard-essential patents. It tirelessly points out that it is willing, in formal terms, to grant a license on a cash-only basis.In practical terms, the fact that Motorola is aggressively pursuing injunctive relief based on standard-essential patents (also in some litigations based on non-standard-essential patents, such as the push notification patent that is being enforced against Apple and asserted against Microsoft, but that's a separate issue) while making exorbitant demands certainly shows that Motorola wants maximum leverage for any negotiations, and it would never have to explicitly demand a license to non-standard-essential patents from those other players: it could simply continue to insist on its out-of-this-world royalty rates until someone starts to offer a broader settlement. At this stage, there's no indication that Apple or Microsoft will blink. If Motorola was truly just interested in a cash-only royalty, I can't see why its lawyers weren't receptive to Microsoft's offer of a $300 million bond to secure any damages resulting from a potentially delayed enforcement of an injunction Motorola might win in Germany. The longer this dispute takes, the more the plot thickens. It's a tough fight for the parties involved in it, but for the industry at large it's actually a good thing that disputes such as this one will result in court rulings that will, certainly not in all but probably in some cases, enhance legal certainty with respect to FRAND licensing commitments related to standard-essential patents. The evidence that litigants adduce in patent infringement lawsuits can be exhilarating, such as one of Samsung's tablet design prior art references. Motorola is now turning one of Microsoft's own books against it in a Seattle lawsuit that is mostly about Motorola's alleged breach of FRAND licensing obligations but also involves a couple of patents that Microsoft used in counterclaims against Motorola. The patent at issue is U.S. Patent No. 7,411,582 on a "soft input panel system and method". Microsoft is also asserting the European equivalent, EP1040406, against Motorola (the Munich I Regional Court held a first hearing on this one in February). This patent covers the concept of having an operating system provide a soft input panel, such as a software-generated on-screen keyboard, to all applications (as opposed to apps having to come with their own input panels). Motorola claims that Android does not infringe this patent, and it appears that one of its non-infringement theories is based on the fact that Android brings up an on-screen keyboard after the user activates a text field that accepts entries, as opposed to requiring the user to tap on a keyboard symbol. (Actually, in some situations Android devices do require just that: on my Galaxy Note it is necessary to tap on a keyboard icon to go back from the stylus input, or optical character recognition, mode to the software-generated keyboard). Microsoft's proposed interpretation of the term "icon" for the purposes of this patent is "an on-screen representation of something". Motorola writes that the meaning of the word "icon" is "surprisingly" in dispute, and proposes "a small image displayed on the screen to represent an object that can be manipulated by the user". Microsoft argues that Motorola's Android-based devices infringe the '582 patent even based on that definition. Motorola dismisses Microsoft's proposed construction as "overbroad". In my opinion, there's no doubt that the Microsoft Press book back in 1997 defined icon too narrowly because icons don't necessarily represent objects that the user can manipulate. In other words, the book certainly has a quality problem in this respect, while the patent may not. 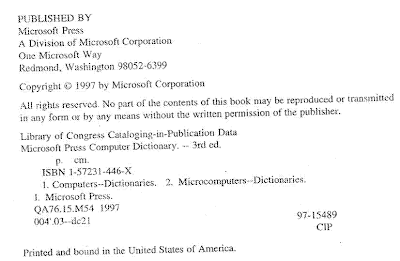 Microsoft's proposed construction, "an on-screen representation of something", is derived from some other dictionaries -- books that at some point presumably competed with Microsoft's own book. I haven't looked at this patent and its prosecution history in sufficient detail to know whether or not Microsoft's broader proposal is appropriate for the particular purposes of this patent. We will find out soon how the judge decides to interpret the term. 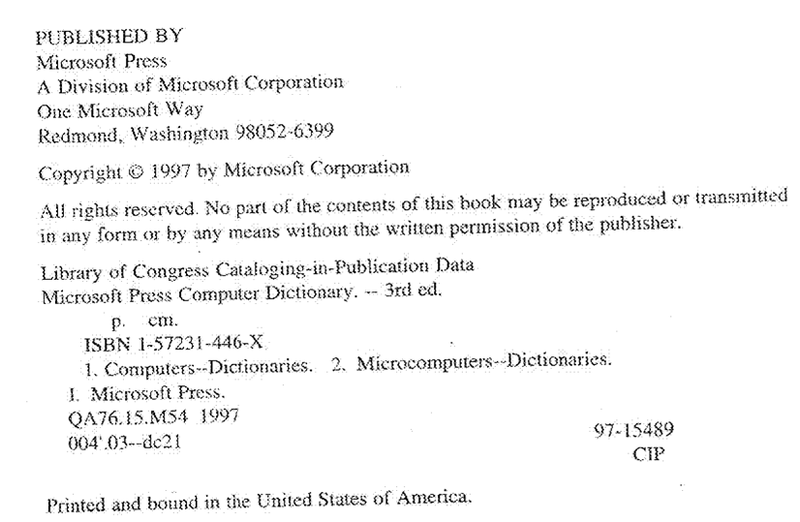 It would certainly be ironic if Motorola ultimately owed a finding of non-infringement in no small part to a definition a Microsoft Press book provided 15 years ago. Even though the outcome of this patent infringement claim should depend on what the appropriate claim construction is under patent law rather than what a Microsoft publication said 15 years ago, Motorola certainly made a smart move by proposing a definition that was published in Microsoft's name and forcing Microsoft to rely on definitions provided by third parties. In its litigations against Android, Apple is still on a quest for the Holy Grail in terms of a few patents that are broad enough to be powerful (to the extent that Android device makers would have to settle) but nevertheless able to withstand challenges to their validity. So far, those Apple patents on which any court rulings have come down are either broad but (likely) invalid or valid but too narrow to bring about settlements that would meet Apple's strategic needs. This isn't Apple-specific but would apply to most patent holders. Over time, Apple can identify a long list of enforceable patents of the "data tapping", "overscroll bounceback", "slide-to-unlock image" and "photo gallery page-turning" kind: none of them would singlehandedly endanger Android, but a whole all-star team of such patents would provide meaningful product differentiation. With a bit of luck, Apple may get a "hole in one" if it manages to enforce one or more "killer patents" with an impact far in excess of that of even five or six patents of the first category. Without one or both of the above kinds of progress, Apple is neither able to defend the uniqueness of its products nor in a position to command significant license fees. At this juncture, the patent that has, relatively speaking, the best prospects of singlehandedly securing victory for Apple -- and the patent that probably scares the living daylights out of Google's Android team -- is the "touchscreen heuristics" patent (whose inventors include Steve Jobs). In June, there will be trials at which Motorola and Samsung have to defend themselves against this one. The '949 patent covers, with respect to a handful of rather basic gestures, the problem-solving strategy of interpreting the user's touchscreen commands by recognizing swipes that are not straight lines (a human being can hardly draw a perfectly straight line) by virtue of a certain level of tolerance. I have repeatedly said that this concept should not be patentable in my personal view, but I accept that Apple is quite successful at convincing different judges that this is patent is legitimate under the existing legal framework. In January, Judge Richard Posner, a legendary judge and legal scholar, provided a first analysis of that patent that was very much in Apple's favor in its Chicago litigation with Motorola. Apple was quick to inform the ITC (where it is asserting this patent against Samsung) of Judge Posner's take. In early March, an Administrative Law Judge at the ITC also issued a claim construction order that worked out very well for Apple. He agreed with Apple that the term "based on the angle of initial movement of the finger contact" is self-explanatory and rejected Motorola's proposal to make this the sole criterion for the determination of what the user wants to do. He asked the parties for further input regarding Motorola's claim that the key claims of the patent fail to provide the structure required under the law for so-called means-plus-function claims. On March 26, Apple and Motorola provided their supplemental claim construction briefs, and on Thursday, March 29, Judge Posner entered his related order, which is a clear win for Apple over Motorola (and Android in general). Jury trials come with considerable uncertainty, but based on Judge Posner's conclusions, Motorola will realistically be unable to avoid a finding of infringement and will have to come up with some really good invalidity arguments if it wants to avoid a disaster. It can, of course, still appeal the upcoming decision in Chicago to the Federal Circuit, which might interpret the patent differently or follow Motorola's indefiniteness arument (which I, in fact, support philosophically). Patent language: "a vertical screen scrolling heuristic for determining that the one or more finger contacts correspond to a one-dimensional vertical screen scrolling command rather than a two-dimensional screen translation command based on an angle of initial movement of a finger contact with respect to the touch screen display"
Simply put, this is about the distinction between a diagonal movement ("two-dimensional" meaning that there's a movement in the X as well as the Y direction) and a vertical scrolling swipe. If the initial angle is less than a specified angle, the command is a vertical scroll; otherwise it's a diagonal movement. The wording quoted above refers to the scenarios in which the determination is that the user wants to scroll vertically. Judge Posner already declared this passage valid in his January order and now decided to interpret it in accordance with Apple's proposal. Patent language: "a two-dimensional screen translation heuristic for determining that the one or more finger contacts correspond to the two-dimensional screen translation command rather than the one-dimensional vertical screen scrolling command based on the angle of initial movement of the finger contact with respect to the touch screen display"
Simply put, this is about the same distinction as the previous one, just with a different conclusion (the user wants to scroll diagonally). Accordingly, Judge Posner also decided on this one in Apple's favor. Patent claim language: "a heuristic for determining that the one or more finger contacts correspond to a command to transition from displaying a respective item in a set of items to displaying a next item in the set of items"
Simply put, this is the gesture that is used, among other things, to flip through photos in a digital gallery. Apple told the court that its patent describes two kinds of flip-to-next-item gestures: a horizontal right-to-left finger swipe and a finger tap on the right side of the screen. Judge Posner agrees on the finger tap at the margin of the screen but felt that the patent doesn't clarify how a right-to-left swipe would be distinguished from a horizontal scrolling gesture. It appears that Apple's patent doesn't describe the other criteria that would be applied. In some cases, the horizontal swipe might have the desired effect simply based on the application that is running (photo gallery, for instance). In other cases, the distinction might depend on whether one makes the gesture only once versus twice in short succession, or on the width of the movement. But the patent doesn't appear to say so, and that's why Apple can't assert it against Motorola in connection with that particular gesture. Apple could still assert it with respect to the finger tap at the margin of the screen, but if Motorola even has an infringement issue, it would probably find prior art. Patent language: "a heuristic for determining that the one or more finger contacts correspond to a command to translate content within a frame rather than translating an entire page that includes the frame"
Simply put, this is about scrolling within a certain region of a displayed document, such as a rectangle in which a map is being displayed, versus scrolling the document as a whole. The two proposals Apple makes are a distinction based on the number of fingers used (with the use of one or more additional fingers limiting a gesture to a region) and a distinction based on whether the gesture is made inside or outside the relevant region. Judge Posner found that the patent's description supports the first criterion (number of fingers) but not the second (location of gesture). Patent language: "a heuristic for determining that the one or more first finger contacts correspond to a one-dimensional horizontal screen scrolling command rather than the two-dimensional screen translation command based on the angle of initial movement of the finger contact with respect to the touch screen display"
Simply put, this is the horizontal version of the first term. Accordingly, Apple prevailed on this one, too. "I reject Motorola's argument (this is the third time they've made it and the third time I reject it) that the structure must be limited to the 27-degree angle used as an example by the specification." I have read the patent and the 27-degree angle is clearly identified as merely an example. Motorola can't seriously believe that this is a way out of infringement. Like I said further above, Motorola will either need to invalidate this patent based on prior art or will depend on an appeal (to have one or more of Judge Posner's legal findings overturned). "[H]aving identified the problems associated with imprecise finger gestures, solved them, and successfully incorporated them into a commercial product, Apple should be entitled to the fruits of its innovation via broad patent protection, and the public is benefited by the disclosure of Apple’s invention." The public would be benefited by the disclosure after the expiration of this patent in 2028. Yes, 2028. I can't see that the ideas Apple came up with here -- and those are good ideas, for sure, but sooner or later others would have come up with them anyway -- should result in a monopoly until the year 2028 if this is meant to benefit the public. Apple argues that "if it turns out the claims are too broadly written and run afoul of the prior art, that is an issue that may be resolved at trial or via summary judgment", which is legally accurate, but the idea of interpreting gestures, which are inherently imprecise if made by a human being, by applying a certain degree of tolerance shouldn't be patentable regardless of who was first to come up with it. That's why I agreed with Motorola's request to declare the patent invalid for indefiniteness. But Apple won in Chicago, Apple won at the ITC, and now Motorola and Samsung, and the Android ecosystem at large, face a serious threat. If Android devices can't implement any of the gestures described above, they won't be competitive. Les Échos, a French financial daily, reports that deep divisions in the industry over the future SIM card standard made it impossible to reach an agreement at the ETSI meeting that started yesterday (Thursday) and ends today (Friday). According to the report, the participating companies have failed to reach an agreement and decided not to hold the envisioned vote. In accordance with ETSI rules, the vote will now have to be postponed by a minimum of 30 days. I wanted to share this news from France, which Twitter user @Awax alerted me to, right away. I will try to obtain more information later. I will spend a couple of hours in a Mannheim courtroom today to watch an Apple v. Samsung trial, so I may find out about further developments only with a certain delay. On April 17, the Mannheim Regional Court will hand down its ruling on a lawsuit in which Motorola Mobility (or more precisely, a wholly-owned MMI subsidiary named General Instrument Corporation) is suing Microsoft over two patents allegedly essential the H.264 video codec standard. Based on the debatable but firm positions the presiding judge took at the trial, it's not at all unlikely that Motorola might win a German patent injunction against Windows 7, the Internet Explorer 9, the Windows Media Player and the Xbox 360 (as far as those products implement the ubiquitous H.264 video codec standard). The Google subsidiary-to-be was quick -- unusually quick by German standards -- to enforce two such injunctions against Apple (1, 2), but if it wins an injunction in Mannheim on April 17, a U.S. federal court might bar MMI from actually enforcing it while a lawsuit in Seattle, where Microsoft sued Motorola back in November 2010 for breach of its FRAND licensing commitments, is pending. At a March 9 hearing, Judge James L. Robart, the judge presiding over the Seattle case, gave Microsoft permission to bring such a motion. I reported on that permission, the scope of which wasn't clear based on the minute entry. An excerpt from the hearing transcript (Exhibit 1 to one of the declarations supporting Microsoft's motion) shows that Motorola's counsel, Jesse Jenner, vehemently opposed the idea of even letting Microsoft bring the motion, but the judge pointed out that the motion would have to be judged on its merits and shrugged off claims that a U.S. court shouldn't interfere with a German dispute by saying: "Welcome to the Ninth Circuit, sir." Indeed, there is precedent in the Ninth Circuit (and in other parts of the United States) for anti-suit injunctions and other measures to preserve the status quo while U.S. litigation over licensing and similar obligations is pending. Microsoft is not proposing to have a U.S. court tell a German court what to do, or to overrule a German court -- it is merely demanding that Motorola refrain from premature enforcement of the injunction it may win in a couple of weeks, which appears particularly reasonable since parties winning German patent injunctions rarely enforce them while they are on appeal (and Microsoft will appeal if it loses in Mannheim). Such injunctions aren't self-enforcing: it takes an enforcement letter and, in the event of premature enforcement, a bond. Everyone I talked to in Germany -- lawyers as well as reporters -- about the practice of enforcing injunctions during an ongoing appeal confirmed to me that enforcement of patent rulings during an ongoing appeal is extremely rare. Microsoft is not asking for anything unusual here. On the contrary, it is merely demanding that MMI refrain from unusually hostile and pernicious measures to gain leverage. The Seattle action in which Microsoft brought this motion started in November 2010 as I mentioned above, while Motorola's related German lawsuits were filed in July 2011. In light of that, Microsoft's motion "seeks to prevent Motorola from making an end-run around the authority of [the United States District Court for the Western District of Washington]". In the Seattle action, Microsoft is fighting for its right to receive a worldwide license on FRAND terms. If and when Microsoft succeeds with that claim, Motorola will be unable to enforce a German injunction anyway. Microsoft asks to preserve the status quo for the time being. Microsoft states its willingness to post a $300 million bond, which should be more than sufficient to protect Motorola against any harm it may suffer from not being able to seek premature enforcement of the potential Mannheim injunction. Footnote 2 even states that "Microsoft would consider increasing the bond amount" if Motorola opposed Microsoft's motion because it considered the amount inadequate. At the Mannheim trial I learned that Microsoft also posted a bond over approximately 1.5 million euros ($2 million) in Mannheim to guarantee any license fees it may end up owing MMI. Compared to that amount, the $300 million offer in Seattle is hugely greater. This certainly doesn't mean that Microsoft really believes Motorola will ever be entitled to an amount of that magnitude. The apparent purpose is to show that Motorola doesn't need to enforce an appealable injunction in order to protect its interests. It will be covered at any rate. "The German Orange Book practice does not require that Motorola enter into a license on RAND terms, only that Motorola accept a license at the outermost limit of legality under German antitrust law. Motorola’s commitment, however, is to grant worldwide [F]RAND licenses, not merely to abstain from antitrust violations in one country. The German courts have not decided and will not decide whether Microsoft is contractually entitled to a [F]RAND license." One of the declarations in support of Microsoft's motion was authored by Microsoft's counsel in the Mannheim litigation, Professor Peter Chrocziel of Freshfields Bruckhaus Deringer, a leading European law firm, explaining the German legal situation. I uploaded that document as well. Following Microsoft's motion, the court will presumably want to see MMI's response very soon. After that one, there would still have to be time for a reply brief from Microsoft between now and the requested April 20 motion hearing. This is undoubtedly one of the most interesting developments in the ongoing smartphone patent wars. I am now going to attend a trial at the Munich Regional Court. In that action, Microsoft is asserting a non-standard-essential patent against Motorola's Android-based devices. Microsoft brought several German actions only after MMI elected to turn Germany into a battlefield. After Apple made its royalty-free patent licensing offer related to nano-SIM, Nokia said it was not aware of "any Apple IP which it considers essential to its nano-SIM proposal" (though Apple declared a U.S. provisional patent application to be potentially essential) and reiterated, as its primary concern, its positions that its own proposal is superior and that "Apple's proposal does not meet the pre-agreed ETSI requirements". Today Nokia issued another statement according to which it won't make its patents available to implementers of the nano-SIM standard should Apple's proposal be "selected in violation of ETSI's rules". Nokia claims to hold "more than 50 patent families covering SIM related technologies that [it] believe[s] may be essential to Apple's proposal". Nokia states that it will, however, honor its "existing commitments to license its standard essential patents under FRAND terms to earlier adopted ETSI standards". If -- I repeat, if -- it is true that Apple's nano-SIM proposal "does not meet ETSI's technical requirements" and that it could only be adopted in contravention of ETSI's own rules, then Nokia certainly has the right to argue that its FRAND licensing obligation, which it has in its role as a member of the committee working on this particular standard, does not apply to nano-SIM. Given the complexity of the technical issues Nokia raises, a court battle over this question could take years. ETSI is based in France, so any disputes might have to be brought before French courts. In such a litigation, it would have to be established whether Apple's proposal was in line with ETSI's rules. Another question would be whether Nokia would have an obligation under antitrust law to support such a new standard regardless of an alleged breach of rules. And that may not even be the end of the story: assuming that Nokia was found to have a FRAND licensing obligation, there could be another multi-year dispute over the royalty rates Nokia would demand from implementers of a standard it vehemently opposed. Nokia apparently hopes that the prospect of protracted litigation is going to dissuade enough ETSI members from voting in favor of Apple's proposal. Additionally, Nokia accuses Apple of "mis-using the standardization process, seeking to impose its own proprietary solution on the industry and using ETSI merely to rubber stamp its proposal". Given that Apple is willing to make its own IP essential to nano-SIM available on a reciprocal, royalty-free basis, I don't think it's accurate to label it a "proprietary solution". Also, it must have something to offer given that most European network operators support it, according to the Financial Times. Nokia argues that Apple's approach "is not in the best interests of the industry or, more importantly, of consumers" and insists that "the integrity of ETSI's standardization process should be upheld, with pre-agreed requirements and selection criteria used to ensure fair selection of the best technology". In my personal opinion, pre-agreed criteria should be treated with a certain degree of flexibility when it comes to a vote, especially in an industry with fast-changing needs. And I like the idea of letting companies vote without uncertainty about whether the essential patents will or will not be available on FRAND licensing terms. "For Nokia, the principal issues remain the technical superiority of our proposal and that Apple's proposal does not meet the pre-agreed ETSI requirements." Like in any situation in which royalty-bearing standards compete with royalty-free proposals, patent encumbrance must be justified with tangible benefits. I have consistently advocated a level playing field between royalty-bearing and royalty-free standards, letting them compete on the merits rather than exclude one business model categorically, but in any economic context, a premium cost must correspond to an appropriate level of premium quality or it's not worth it. That's one the hurdles that Nokia, Motorola and RIM face at this week's ETSI meeting. As a consumer, I wouldn't want to pay (indirectly) Nokia or anyone else patent royalties unless the cost I (indirectly) bear buys me a real benefit. Another success factor for Apple is the broadbased support it has among European mobile network operators. I trust Nokia that if they say they were "not aware of any Apple IP which it considers essential to [nano-SIM]", they really weren't, but a simple look-up of the ETSI IPR database, which Nokia is undoubtedly very well aware of because it's one of the biggest contributors, would have answered the question. In fact, several hours before I firstly saw Nokia's statement, a Dow Jones Newswires article on Apple's royalty-free offer had already referred to a document posted on ETSI's website. An updated version of the Dow Jones article can be found on the Wall Street Journal website -- the original one, however, appeared several hours prior to that version and already mentioned the ETSI document. And this link points to the relevant declaration by Apple. If you click on the "IPR information statement annex" tab, you get some additional information, including the number of Apple's U.S. provisional patent application that the declaration relates to: 61481114. The problem with provisional patent applications is that they are never published. Within 12 months of filing, they must be converted into a "regular" patent application or else they just expire. Patent applications are in stealth mode for 18 months, so provisional applications never make it to the point of publication (except that "regular" patent applications later reference them because they are relevant to the priority date). Therefore, we can't see what's in that particular patent application (other than the title, "Compact Form Factor Integrated Circuit Card", which Apple's statement to ETSI contains), but frankly, the content of that application is not even the most important thing here. What really matters is that Apple's proposal is generous and in the public interest in this particular context. The FT article showed that there was concern about Apple's patent-based control over the proposed standard. I don't know whether Nokia previously expressed that concern, contrary to its denial of awareness of essential Apple IPRs in the field, but somebody certainly must have told the press about it -- if not Nokia, then some of Apple's other rivals. The key thing is that Apple has not only alleviated but totally eliminated that concern now. The declaration published on the ETSI website relates to only one patent application, and it clearly shows that licenses are available on a reciprocal, royalty-free basis, but the most important thing is that the letter I saw makes the same commitment with respect to any Apple IPR essential to nano-SIM. No trap. No backdoor. As long as Nokia adheres to FRAND licensing obligations, the Finnish company's position that it wants to cash in on its SIM card-related patents is just as legitimate, from a shareholder value point of view, as Apple's proposal that everyone adopt a royalty-free standard. But Nokia's desire to monetize standard-essential patents is not in the public interest unless its proposal offers major advantages that offset the cost of licensing and the higher transaction cost (which in connection with FRAND patents sometimes involves litigation as I see all the time now). There are situations in which royalty-free is the way to go. For example, I wouldn't even want to think about what would have happened if Tim Berners-Lee had patented the World Wide Web and collected FRAND royalties on any technologies implementing it. SIM cards aren't comparable to the WWW, but they are such a basic component of wireless devices that a royalty-free standard would clearly be desirable unless it has major shortcomings. Nokia owns many standard-essential patents, and it's understandable that it's concerned about anything that might "devalue" SEPs. However, since I monitor many litigations in this industry, I'm far more concerned about SEP holders that try to impose excessive license fees and other anti-competitive and anti-innovative terms and conditions than I am about devaluation. It appears that antitrust regulators have a similar perspective at this point. Last week, the Financial Times reported that Apple is at loggerheads with Motorola Mobility, RIM and Nokia over a proposed standard called "nano-SIM", a further miniaturization of the smart cards now known as "micro-SIM" cards. SIM stands for "subscriber identity module". Nano-SIM cards would be thinner and considerably smaller than micro-SIM cards. Apple has the support of "most of the European operators", according to the FT. The two camps are heading for a showdown later this week (on Thursday and Friday) at the Smart Card Platform Plenary meeting of the European Telecommunications Standards Institute (ETSI) in Sophia Antipolis (Southern France). A perfectly reliable source that I can't disclose has shown me a letter dated March 19, 2012 that a senior Apple lawyer sent to ETSI. The letter addresses the primary concern of critics of the proposal. The FT said that "the Apple-led proposal has caused some concern among its rivals that the US group might eventually own the patents". But Apple's letter has removed this roadblock, if it ever was any, through an unequivocal commitment to grant royalty-free licenses to any Apple patents essential to nano-SIM, provided that Apple's proposal is adopted as a standard and that all other patent holders accept the same terms in accordance with the principle of reciprocity. This shows that Apple is serious about establishing the nano-SIM standard rather than seeking to cash in on it. Last year I reported on two different stories (1, 2) about disagreements between Apple and the World Wide Web Consortium (W3C). Let's face it: Apple is a company that values its intellectual property and rarely gives it away for free. But as far as the evolution of SIM cards is concerned, Apple is clearly being generous and absolutely pro-competitive. Apple recently lodged a formal complaint over Motorola Mobility's alleged abuse of standard-essential patents with the European Commission. I watch Apple's litigation around the globe and I don't see them assert standard-essential patents, let alone seek injunctions based on them. In fact, another Apple letter to ETSI (which I published last month) takes a clear "no injunction" position on standards-essential patents. Wherever one stands on Apple's assertions of multitouch patents and other non-standard-essential intellectual property rights, Apple's attitude toward standard-essential patents sets an example that others, particularly Google, should follow. A couple of weeks ago, Apple brought a motion for sanctions against Samsung for multiple alleged violations of a court order regarding source code. Many media reported on the motion at the time. Late on Friday, Samsung filed its opposition brief. Samsung claims that it fully complied with a December 22 court order because it provided the relevant source files of the code ultimately shipped on the accused devices. According to Samsung, that order "does not mandate the production of every version of every accused product and functionality". This is just one of several discovery disputes between these two parties. On Tuesday (March 27, 2012), there will be a hearing that will cover, among other things, a different Apple motion for sanctions (relating to Samsung's alleged withholding of evidence of "copying", which Apple claims could have made an outcome-determinative difference with respect to its denied motion for a preliminary injunction) and a disagreement over depositions of more or less high-ranking Samsung executives. The "copying" issue is the most fundamental one of those discovery issues in my opinion. In that context, Apple might find one or more smoking guns that would make the Lindholm email (a key piece of evidence in Oracle v. Google) pale by comparison. I have no doubt that the issue of source code production will be sorted out soon. If Apple is entitled to access to certain material, it will get it -- the most that can realistically happen here is a delay, even though an exclusion of certain evidence that might otherwise exonerate Samsung is also a possibility under the law. "Apple has had Samsung's source code for the accused products since December 31, 2011, the source code for the implemented design around as of January 23, 2012 and March 10 and 12, 2012, and information regarding the changes that were implemented (including any design arounds) relating to the source code for the accused products as of February 3, 2012. [...]"
"To the extent that Apple claims that any of Samsung’s productions of design-around source code have prejudiced its ability to engage in its infringement analysis, such arguments ring hollow. Apple has known about such design arounds since at least February 3 and March 8--before the discovery cutoff. Moreover, Apple has had ample opportunity to review and analyze Samsung's timely January 23 source code production, and Samsung's subsequent but limited March 10 and March 12 productions—well before Apple's deadline for expert reports." "Indeed, it appears that no one from Apple has inspected the code for Samsung's design around technologies for the '891 or '163 patents [...]; such willful ignorance does not make prejudice." A declaration in support of that brief claims, based on information and belief (i.e., there isn't necessarily hard evidence), "that no one from Apple has printed any part of the code"
If Samsung provided such source code, Apple can try to bring infringement allegations against those designarounds. The key question here is whether those designarounds truly steer clear of patent infringement, or whether they merely constitute a somewhat (possibly just slightly) different infringement pattern. Samsung can change its source code every day (theoretically), but litigation is much slower. At some point during such a lawsuit, it will be too late for Apple to present allegations against new implementations. If Apple won a first ruling against certain implementations and a subsequent one was similar to them (and therefore faced the same infringement problem), then Apple could ask for sanctions -- but such designarounds can also raise new substantive questions. For example, almost all of the infringement allegations Apple has brought against implementations of "slide to unlock" in different jurisdictions related to implementations that were intended to be designarounds, but some were nevertheless held infringing by the Munich I Regional Court (in a ruling against Motorola, not Samsung). If Apple and Samsung don't settle in the near term, we may very well see a cat-and-mouse game in which Apple has to assert the same patent(s) against the same defendant(s) in new lawsuits only in order to catch up with designarounds that may or may not be deemed infringing in the end. There's significant value to Apple in rulings based on implementations that have subsequently been, or will in the future be, replaced. At the very least any such infringement findings entitle Apple to damages, and any injunctions based on older implementations put Apple in a stronger position, and give Apple more tactical options, should new infringements surface. Now that Oracle and Google have a firm trial date (the trial will start on April 16, 2012), the court decided that another attempt to settle the dispute, which started with Oracle's lawsuit in August 2010, should be made. Magistrate Judge Paul S. Grewal, who presided over the parties' court-ordered mediation (i.e., settlement) talks last fall, just ordered the parties to "appear for a further settlement conference", with participants including "at least Ms. Katz [sic] and Mr. Rubin". There's a typo: Safra Catz' last names begins with a C, not a K. She's Oracle's Co-President and CFO. Andy Rubin is Google's Android chief. The parties' lawyers are told to propose "available dates so that the conference will take place no later than April 9, 2012", with March 30 being a blackout date for the judge. The order urges them to "demonstrate maximum flexibility in tendering dates". I'm not sure that this imposition by the court is helpful. With a firm trial date approaching fast and the case having been narrowed substantially (with relatively little left on the patent side, it's now almost exclusively a copyright case), there's a better chance than ever before that the parties may settle -- but if there's a common ground they can agree upon, I believe they will do so even without the court requiring them to show up, and if their positions are still irreconcilable, the compulsory meeting won't yield any result. A partial settlement would also be conceivable: they might agree on how to settle whatever little is left of the patent part of the case but still duke it out on copyright. Even though Oracle's patent infringement claims and its damages claims have been contracted over time, the copyright part of the case still has the potential to give Oracle huge leverage over Google. With an injunction against Android, Oracle would have so much leverage that no one would be talking about damages theories anymore: Google would need a license, and Oracle's demands, monetary and otherwise ("bring Android back into the Java fold"), would not in any way be limited by whatever the court considered acceptable damages claims or whatever the court-appointed damages expert, Dr. James Kearl, may have calculated. In that case, the parties would negotiate freely, with all the pressure being on Google. If Oracle is determined to take its chances with the copyright infringement claims (which are a fairly simple infringement case except for the question of whether the asserted API-related material is copyrightable), then it won't settle. In that case it will let a jury take a look at hundreds of pages of code that Google claims isn't protected by copyright, and it can always appeal -- and possibly assert additional patents in a second lawsuit, if it has more Java-related patents that it can claim to be infringed by Android. Alternatively, if Oracle prefers a face-saving exit, it can try to leverage in settlement talks the fact that the copyright part still poses considerable risk to Google. As some of you may have noticed, the domain name of this blog has been affected by a design decision on Google's part (Google runs the Blogger, or blogspot.com, service). It is now automatically redirected from fosspatents.blogspot.com (the address under which I registered it, and which still appears in the settings of this blog) to fosspatents.blogspot.de whenever I access it. The same actually occurs to Google's own corporate blog (googleblog.blogspot.com) as well. It may or may not happen to users based outside of Germany. Whatever the rationale for that decision on Google's part may be, I've finally decided to assign the fosspatents.com domain to this blog. I registered that one when I created this blog about two years ago. DNS (domain name server) updates have delays of up to 24 hours, and the smallest configuration error results in the temporary unavailability of a site. I just wanted to let you know that I will make this configuration change over the coming weekend (March 24-25, 2012), so don't be surprised if you get error messages when trying to access this blog these days. Thanks for your understanding. I probably should have done this a long time ago since a shorter URL is generally desirable.